According to a recent article by The Guardian, Triclosan was introduced into common household products when Americans became more germ-phobic. The whole anti-bacterial phase has been going strong for the last twenty years, encouraging people to wash with antibacterial soap promising to destroy the evil nemesis – bacteria. However, the facts prove this simply isn’t true. Asserting from this publication, all you need is regular soap. The real propagation is about how someone washes his/her hands as opposed to with what. The CDC (Center for Disease Control) recommends washing your hands for twenty seconds (the length of time it takes you to hum the “Happy Birthday” song twice). Chemicals can only become problematic when they disrupt the natural functions of the human system. University of Chicago professor Jack Gilbert (Ecology and Evolution; Surgery) and Microbiology and ISTP graduate student Alyson L. Yee have published a paper explaining that triclosan, a chemical commonly found in antibacterial products such as soap and toothpaste, may be disrupting the human microbiome. The human microbiome are the flora and bacteria that grows inside of the human gastrointestinal system. These bacteria are necessary to maintain the proper balance and order of our system; it helps us digest our food, fight off “bad” bacteria, eat away waste products, and help our immunity. Yee and Gilbert explore the effects of Triclosan in the microbiome of fish explaining: “Triclosan exposure resulted in substantial topological changes to microbial correlation networks, indicating that exposure might alter how microbes interact and communicate with one another in the gut.” The authors suggest that further studies are needed to understand the chemical’s effects on the human body. Finally, it has been suggested that Triclosan may be contributing to the worldwide phenomena of bacterial resistance. As more people continue to use antibacterial products, the bacteria has evolved to become resistant to antibiotic medications. This has the potential to cause a worldwide threat as numerous disease have almost become defunct because of antibiotics, such as tetanus, rabies, polio, yellow fever and more – the goal is to maintain the antibiotics to keep these diseases at bay. As we know, if we fight nature, nature will always prevail, so it is up to our daily behavior to create lasting changes. Along with washing your hands and body with antibacterial soap, it’s imperative to understand that Triclosan will then get washed down our drains and into the water system – what seems like a small, repeated action actually has long-term and global effects. A simple change: Use natural, regular soap that is free of Triclosan and unnecessary detergents. Science proves it’s just as effective as getting a person clean, without harming your microbiome (gut), or contributing to bacterial resistance. Want more information? Click the links in this article for all of the references used. Ever have a household dilemma that isn’t a big problem, but definitely annoying? We face them everyday, but mostly just find our own work-around and then forget about it. But cheers to the innovators, the inventors, the visionaries, who see these problems and have the insight for a solution! For me, that was canned foods. I’m not a big fan of the sludge that beans soak in while in the can, so I always rinse them off, but it’s a pain-in-the-neck to either try and maneuver the can to rinse it out, or have to go and get a colander just for that. Never something I thought about after the task was completed, but someone did. All of the products I’m about to introduce you to actually solve these types of problems (including one for the can issue). I own every single one of these items and they have proved to be extraordinarily useful in a world of junk we don’t need. All of these items are under $30, and most are even under $10, making these finds absolutely golden. The Jokari Snap-On Can Strainer – Open your can, snap on the strainer (and it’s designed to fit multiple sizes), then flip and drain! 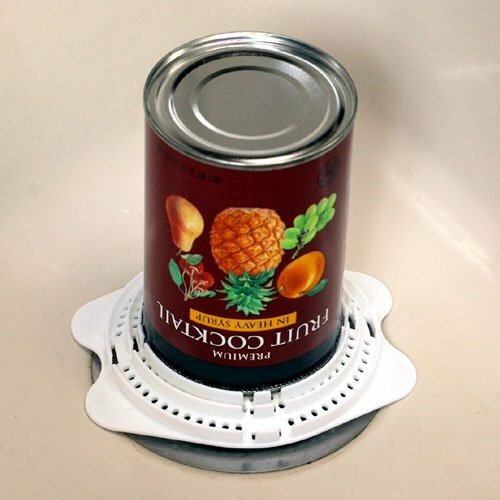 You can fill up the can with water and keep draining – it’s such a simple idea, but absolutely brilliant. Get it on Amazon for about $5! 2. 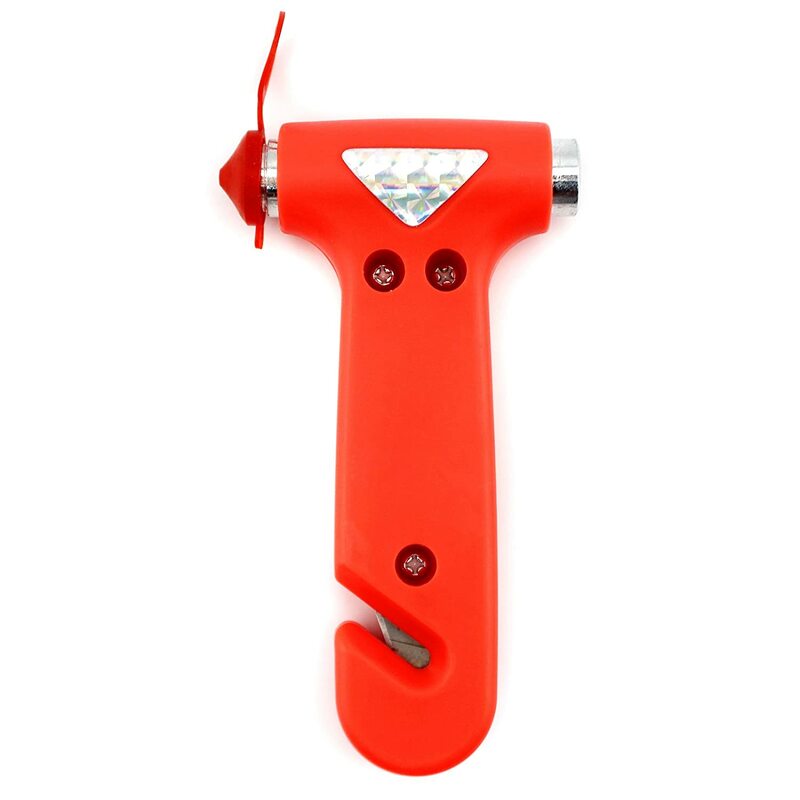 Seatbelt Cutter Window Breaker Escape Tool – I am extremely thankful that I never had to use this item, but have some peace-of-mind with it being inside of my vehicle. This nifty tool has a metal edge so you can crack your window, and a sharp inside knife to cut your seatbelt, just in case there was an emergency and you needed to escape your car. Get TWO on Amazon for about $3.50! 3. 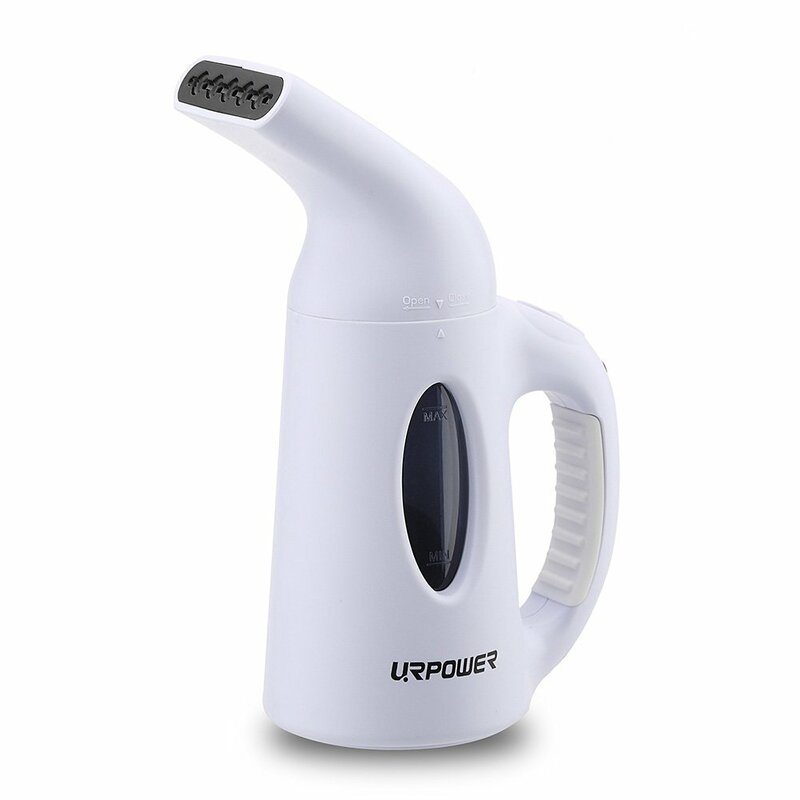 Portable Handheld Steamer – I absolutely hate ironing. Laying out the ironing board, trying to maneuver the clothes so you don’t get weird creases, waiting for it to cool down; it’s annoying. This little steamer is the solution. For one portable device, it packs a punch. All you have to do is hang up your clothes and steam them from the inside out – presto, wrinkles gone! I literally have a $150 iron that I have never used because of this steamer. Grab it on Amazon for about $30! 4. Sani-Sticks – Enzyme Activated Drain Opener and Cleaner – Since making my own skincare and soap, I have tried to live a more natural lifestyle, and that includes household maintenance. We don’t always realize how much gunk falls down our drains, or how delicious that is for drain flies (if you’ve never had them, you’re lucky). 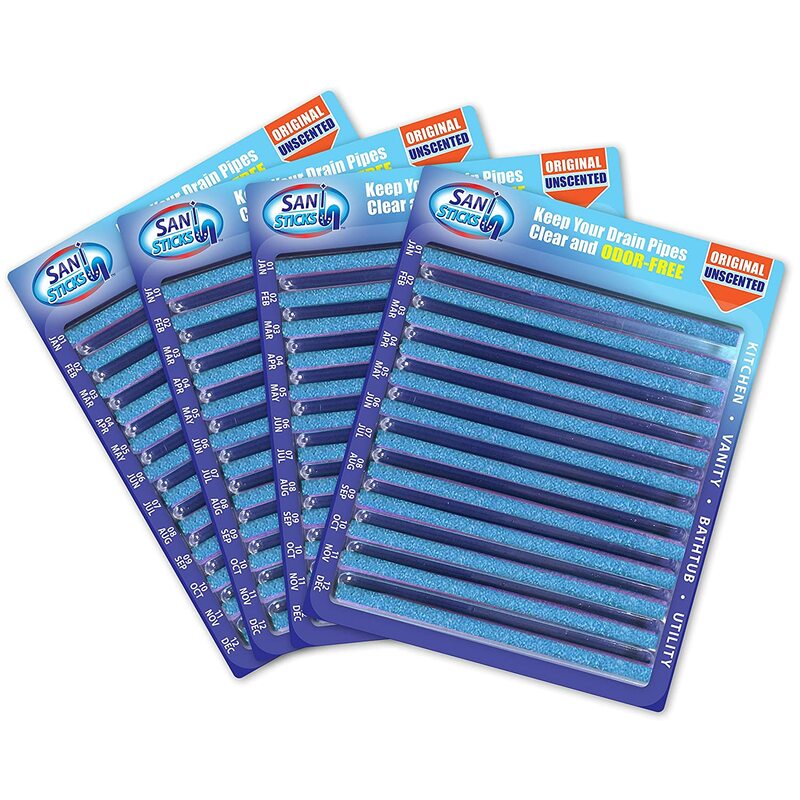 The only way to really remove gunk is to snake out your drains every now and again, but as monthly maintenance, these sani-sticks really work wonders. Because they’re activated enzymes, they actually eat away at organic material (like the food that falls down the drain), which helps keep your drains clear. The suggestion is one stick a month (I throw in two), but I haven’t had drain flies since. Get a 48 pack on Amazon for $20! 5. 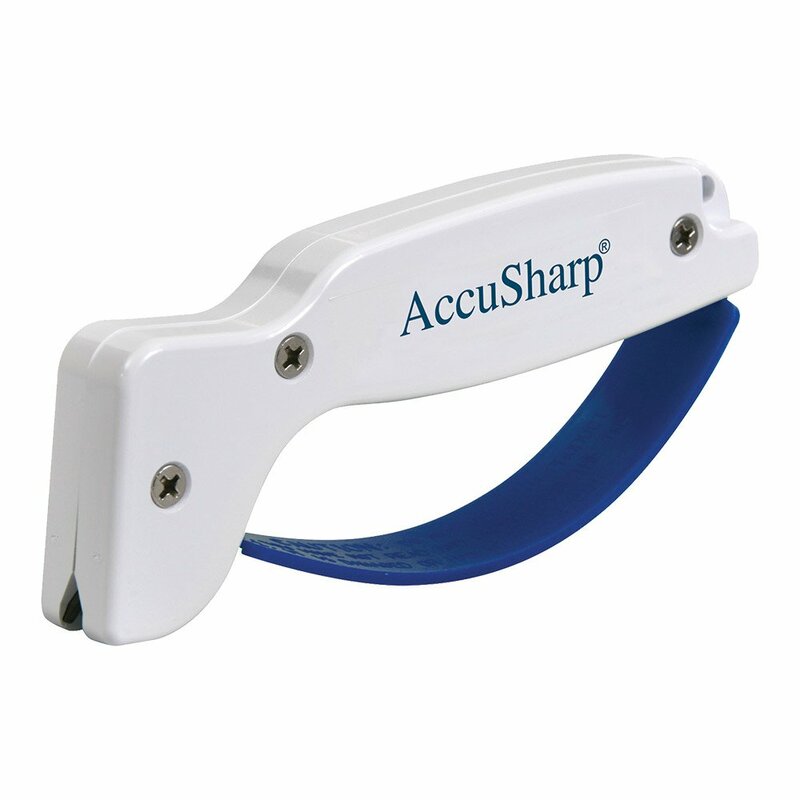 AccuSharp Knife Sharpener – If you’ve invested money in quality knives (and you really should if you haven’t), then you understand you need to maintain them by honing them and sharpening them on a regular basis. Well, most knife sharpeners are clunky and really expensive, and then came along this guy – the AccuSharp. It is so incredibly simple to use, and extraordinarily effective at keeping your knives sharp. I went and bought one for my parents and always like to give it as part of a housewarming gift. Grab yours on Amazon for around $10! Do you have any gizmos or gadgets that have proved to be especially useful around the house? Please share in the comments below! I have a love/hate relationship with my ambition. When I get an idea in my head, I run with it, and I do not stop until I accomplish what I want. I have been successful in almost every one of these endeavours…except dieting, but we won’t go there. The problem with this sort of zealot ambition is the need to persevere at any cost, and most of the time, that cost is my own sanity. You have to work hard to win big, right? You have to do it yourself to make sure it’s done correctly. You have to be in control of every little detail. No. Let me repeat, NO. This sort of mindset has kept me up at night, has given me undue stress, has given me an anxiety issue. The moment I found peace is when I learned how to ask for help. The thing with “help” in business is that it usually comes at a price. My original website was functional, but hideous. My original pictures were photos I took on my phone and terrible cut-out jobs from free online photo editing programs. It all worked, but it didn’t work well. I needed help, but I was on a severe budget. That’s when I turned to networking. You get by with a little help from your friends, right? When I just started asking – and I did that by posting on Facebook – people I haven’t spoken to in years chimed in, and not only did they chime in, they wanted to help. Knowing I was a small business, they gave me a ton of breaks and great deals. Dean Pagliaro of eCommerceDean was in the same boat: He just left his high-profile position as a web designer to open his own business, and he asked me if I would be his first client. One of the best decisions I ever made. Bryan Maes of Inspiration Studios had been running his photography studio as a side gig for years, I called and asked him for help, and now I actually have attractive photos. You need to network. You need to decide when something is right for your business, and when it’s not. When we first got started, I accepted every single vendor opening I could. From basements, to houses, to churches, to huge expos, everything. Sometimes it resulted in a new customer base, sometimes it was awesome sales for that day, sometimes it was getting drenched in the pouring rain, covered in mud, with melted products, and an unwanted wet t-shirt contest. I know when to say no, now. You have to think about your goals and decide what will help you achieve them, and what will be a waste of your time. I wish I had mastered my business plan. I was way too quick to turn my crafting into a business. I knew how to make my products and I rushed to turn them into a business without thinking about my long-term goals, or considering how I would want to change in the future. The truth is, I needed someone to talk to that was much more experienced. I joined Facebook groups and networks, but sometimes their experience was intimidating and they were often frustrated by my newbie questions. I needed a life coach and a business coach to show me my potential, to help me narrow my niche. We can’t all afford the luxury of a big-time coach, but it is an investment in your future self. I now know where I want to go, but it would have been a lot easier to know that from the beginning. I’m going to give you a gift that I wish I had when I started, and I call it The Creative Cheat Sheet. It’s a comprehensive list of all the people I wish I knew before I got started; I hope it will prove useful for you! Just a quick blog update to remind you all the the first workshop in a series of four workshops is at 7:00pm tonight at Zen Art Gift Shop, 1600 Richmond Road, Staten Island, NY 10305. Tonight’s workshop is aimed at BEGINNERS, people who have been crafting and now want to turn their crafting into a business. We’ll discuss the questions you need to ask before starting, the steps to get there, some pricing strategies, your target market, and more. This workshop is for you if you are ready to work hard to turn your crafting into a business. Success does not happen overnight, and I am eager and willing to share my experience so you won’t make the same mistakes I did and you can start building a successful business right away. I would love to show you the ropes, and truly encourage small businesses to thrive and succeed, so I hope you will join me. If you’re not local, or you can’t make it tonight, I will soon have video tutorials available for purchase. I’ll also be using my LinkedIn account as my focus for the Creative Entrepreneur group, and I will still be leading and managing the Vine Vendor Network on Facebook. I recommend you connect with me to gain insight and learn from others who are just like you. If you are spending your hard-earned money somewhere, you deserve to be treated with the utmost respect. This is a hard and fast rule. Any company that makes a customer feel less than valued will simply not survive. A little back-story: Over one year ago I joined a gym. After three weeks of attending the gym, I opened Bath, Body, and Candle Moments. Between working two full time jobs, I needed to find a way to exercise much closer to my home to save time. I didn’t want to pay for something I was no longer going to use, so I sent a certified letter requesting my membership be canceled – exactly 21 days after joining. Put it this way, I am still fighting with this gym and I’m out $300! A franchise of this gym is now opening within walking distance of my teaching job; I could literally just walk right there after or before work – but there is no way I would give them my business. Whether you’re meeting someone new, attending a party, or responding to an angry review, every single person you encounter is an interview. Each interview you have is a potential customer, the possibility of networking, a judgement on how you run your business. The way you treat people, the way you behave, the way you dress is all forms of customer service because whether it’s direct or indirect, each action is being perceived and people translate those perceptions into your business. For example, let’s say you’re out a lunch meeting with a group of people and one person snaps at the waitress, what are you thinking about that person? Most of the time when customers complain about something, they’re right, but sometimes, they’re not. Use the opportunity of a customer’s error to show how you go out of the way to help them. For example, I offer free shipping to Staten Island customers – it’s a way for me to connect with my local community – but I don’t have the option of limiting that choice at check-out to Staten Island zip codes, so all of New York State sees it. A few times, I’ve had a customer from out-of-town choose that shipping option, instead of denying the customer, I wrote an email explaining about our local policy, but offered free shipping for that one time only. Most customers will appreciate the extra courtesy and accept their error with grace; you’ll create repeat customers by going the extra mile to correct their error. Seems like a given, right? But far too often there is fine print or convoluted messages that are turning your customers off. Be clear in your product descriptions, offering details, ingredients and measurements (if applicable). If there are certain fees, make it bold and clear. A customer is much more likely to make a purchase if he/she understands the fees to begin with. Going against the grain here, get rid of subscription fees! When we decided to offer the Soap-of-the-Month Club, we could have gone with recurring billing, but why force your customer into a situation where he/she would have to go out of the way to cancel something when he/she no longer wanted the item? Instead, we opted for a one-time up-front fee, so the customer knows that all he/she has to do is make this one purchase and then the goodies just keep showing up in the mail. No hidden messages, no gimmicks – that’s how you build trust in your brand. I was recently at a vendor fair and I overhead these water-filtration vendors telling a customer that their water cured cancer. I wish I was kidding. Along with that, they were using all kinds of cryptic scientific language that may seem impressive, but could be overwhelming to someone who doesn’t understand what’s really being said. While this foot-in-door technique could be effective to gain initial sales, in the long run, you’re going to end up with a lot of returns and disappointed customers who feel jilted and cheated. Explain what your product CAN do (and remember the LAWS), be honest about what it CAN’T do, and let the customer make a choice. I often get questions about whether or not our body butters will help with eczema or psoriasis – these are dangerous questions in the cosmetic industry because now we’re talking about over-the-counter drugs. I simply respond: “I make no claims about curing ailments; I made this product to moisturize your skin.Would you like to learn about the ingredients to understand how it softens your skin?” Teach about ingredients, teach about process, explain, and educate. There’s no way a company can satisfy everyone all of time. A courteous customer will inform the business about his/her problem first before posting a negative review, but there will always be negative nancies who go straight for the throat. It’s fine. Take a deep breath, and RESPOND to the negative review with courtesy, explanation, and an offer to assist the customer by phone call or email. By taking this action you’re simultaneously diffusing the situation while demonstrating to potential customers that you do care about what they have to say. Every neutral interaction you have with a customer is an opportunity to educate them about your brand, every positive interaction is an opportunity to bring further joy, and every negative interaction is a chance to turn it to a positive. All of these opportunities can arise from one simple customer service tool: Follow Up. An email or a phone call can go a long way in letting the customer know that he/she has been heard. For a neutral interaction (a customer asks a question, for example) – follow up in a day or two to see if he/she has any further questions. For a positive interaction – send a quick email just to thank the customer for making a purchase/using the service, etc. For a negative interaction – a phone call in a day or two to see if the problem has been adequately resolved. One of the best examples of this is something a local real estate agent does – After her customer closes on a home, she sends them one of our candles and a couple of bars of soap with a note that says: “Blessings for Your New Happy Home.” It’s a simple gesture which goes a long way, and leads to referrals. What do you look for in exceptional customer service? The digital world is not the evil nemesis of art, it is the blessed child, moving in symphonic gestures, mimicking the guiding mother. Before crafting became a business, for me it was an escape from the world around me. I would close my laptop, silence my phone, and just start making whatever I felt like making to shut everything down. Sometimes it was cooking dinner or baking, sometimes it was candles, and sometimes it was a scrub. Ironically, once I turned handcrafting artisan skincare and candles into a business, I found myself glued to my computer and my phone more than I ever was before. Updating the website, writing blogs, posting, commenting, I feel like my technology is attached to me. More often than not, it doesn’t bother me; I enjoy being engaged online – it allows me to connect to people from all over the world, but there are moments when all I want to do is disengage. And that’s when I close my laptop, silence my phone, and just start making. I’ll use my nose to arrange fragrances. Florals mixed with woods, and a hint of citrus. Mix, match, test, repeat. I’ll use my eyes to analyze texture. Thick and fluffy, with enough depth to be tangible. I’ll use my hands to create. Pour, stir, whip, drip, angle. I make, and when I make, I create art. There’s a sense of connectedness I feel when I create. Every pour, mix, sniff, and package is a little part of me being born into the world. A version of every product I make, whether it’s soap, lip balms, or candles, has been factory generated. My grandmothers would sew, stitch by stitch, one little thread at a time, until it became a gown or a fur coat. Somewhere there’s an assembly line worthy of Henry Ford where machines are pouring, filling, stitching, and labeling in mass quantities. While there’s a beauty in the methodical and rhythmic beat of machine precision, it lacks one major aspect: art. The world needs more art. The aesthetic was once the most important factor in the humanities, dating back to Aristotle’s Poetics. Since the Industrial Age, art has been tossed aside as secondary to mathematics and science. You can always learn about a culture’s values based on the emphasis in their educational system, and for decades, as budgets continue to be slashed, the arts are the first thing to go. In lieu of the arts, the focus has become on technology, math, and science. There is nothing wrong with strengthening these skills, but there’s one major point that seems to be missed in contemporary culture (but a point the Ancient Greeks, Romans, Egyptians, all the way through the Romantics knew): there is no technology, math, and science without art. There is no industry, architecture, engineering, law, and medicine without art. The art of hand-crafting is at the very core of primal humanity. The irony in all of it is that the digital age is possible because of art, because of hand-crafting. Before a machine could learn the steps to creating, it must be taught by a creator. When I shut myself off to the digital world to hand-craft and create art, I’m not really shutting off, and no one who crafts is – in reality, it’s a contribution. All creation is contribution, progressive movement. Art and craftsmanship is innovation. Fingers dancing across a piano, wrists swerving brushes across a canvas, muscles churning the oils to make soap – the art, the beauty, the aesthetic, the innovation. It’s not the digital world which proposes the problem, it’s the lack of creation it can induce. The Monks of Tibet practice mandala, where they spend weeks creating a beautiful work of sand art and upon completion, they sweep it away to start again. The digital world begs why, cries out for the inefficiency, but the artist, the handcrafter, understands. Art is patience. Art is discipline. Art is math, science, philosophy, literature. Handcrafting is art. The digital world cries out for art. I (Kristen) met Carol DiMarco at the Spring Holistic Expo on Staten Island in April 2016. At the time, I didn’t know that she had a big plan for her current shop and was actually scouting out different artists. Receiving a phone call from one of Carol’s associates about a month after the show asking me to bring our products into Zen Artisan Gift Shoppe was serendipitous to me, but as an entrepreneur with a huge vision, it was all part of Carol’s plan. Carol DiMarco is the owner of Blue Label Design, always having an eye for creativity and interest in the holistic arts, Carol became certified to practice Reiki. Partnering with Anthony Schifano, who is a licensed masseur and wellness advocate at Zen Health & Wellness Center, the idea of Zen Artisan Gift Shoppe was born. Located at 1600 Richmond Road in the Dongan Hills section of Staten Island (across the street from the Dongan Hills Public Library), Zen is a little taste of Sag Harbor, Cape May, New Hope in Staten Island. After stopping by the shop last week to see how everything was going, Carol and I discussed translating my educational experience, with my art, and my knowledge of business. She asked if I would be willing to teach a workshop. After much discussion and collaboration, I am proud to announce that I will be teaching a workshop series at Zen: How to Turn Your Craft into a Small Business. The goal is to teach and encourage creative entrepreneurship. I am very fortunate to have had the guidance of many powerful women entrepreneurs, and the mistakes of starting my own business from the ground-up, I am excited to teach others from my experience and knowledge. I hope you will join us at one of the workshops, or if you aren’t looking to start your own business and just love art and wellness, please stop by Zen! If you have any particular questions that you would like for me to address at these workshops, please comment below. *Photo credits – courtesy of Zen Artisan Gift Shoppe, as seen in the Staten Island Advance.